The defensive consistency, coupled with 22 points from LaMarcus Aldridge and 18 more from Rudy Gay, led the Spurs to their fourth straight victory. Patty Mills had 10 points. Memphis’ 79 points were two short of the season-low for a San Antonio opponent. While the attitude was different, it didn’t offset the Spurs talent and depth. Memphis held an early lead, but it didn’t take long for San Antonio to overcome the advantage and lead the rest of the way. 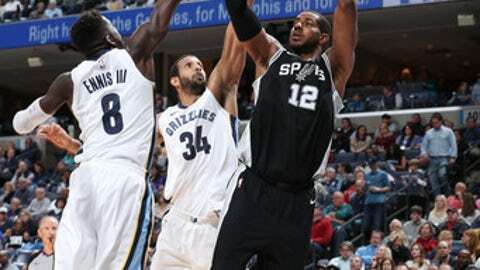 Spurs: Aldridge had a season-high 41 points against the Grizzlies on Wednesday night. … San Antonio shot 44 percent, and the Spurs are 15-0 when they outshoot an opponent. Grizzlies: Chandler Parsons (right knee), Mario Chalmers (right ankle) and Brandan Wright (right groin), all of whom sat out Wednesday’s game at San Antonio with injuries, played Friday. … However, Wright experienced tightness in the groin during the first half and did not return. … McLemore surpassed his season-high with 11 points in the first half. The 10-game losing streak is the longest for Memphis since losing 12 straight in January 2009. Memphis has not won a game since a road victory at Portland on Nov. 7. The Grizzlies last home win was Oct. 28 over the Houston Rockets. ”The guys are down about it, but what happens sometimes when you on these streaks is one punch and you just start thinking about (the struggles),” Bickerstaff said. Injured Spurs forward Kawhi Leonard accompanied San Antonio to Memphis, but did not play. Spurs coach Gregg Popovich said before the game that Leonard, who hasn’t played this season because of a quadriceps injury, may return soon. ”He’s getting closer all the time,” Popovich said. ”He could be back sooner rather than later.” Leonard’s teammates are looking forward to his return and getting players back in their regular roles. Patty Mills is playing with the second unit since Parker’s return, and Kyle Anderson eventually will go back to the reserves when Leonard is healthy. ”We’ve been playing together for a long time and we are used to each other,” Ginobili said.